There are only a very few Battle of Britain Pilots that are still alive. Sadly within the space of one week 2 of the remaining pilots passed away, the one on 11th July and the other on the 18th July. 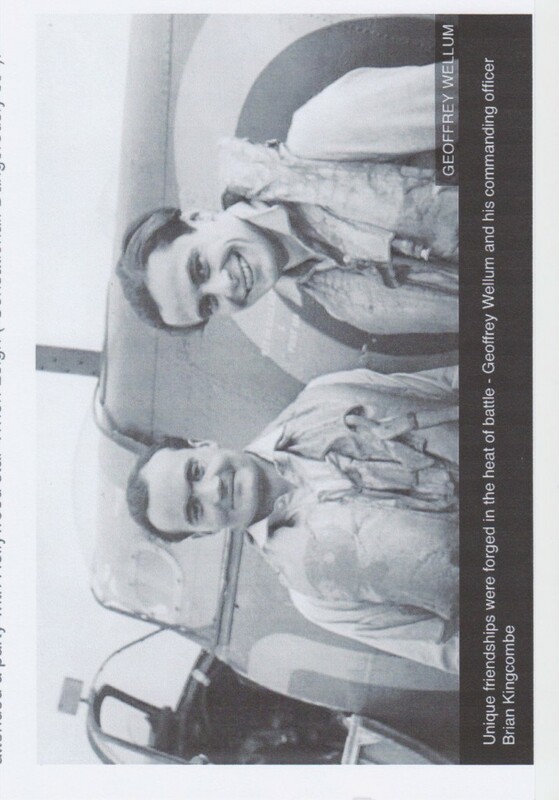 Herewith some information on these two exceptional BoB pilots. 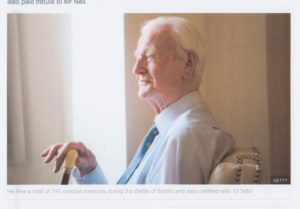 Thomas Francis ” Ginger ” Neil DFC & Bar, AFC, AE, one of the last surviving RAF ‘ aces ‘ who fought in The Battle of Britain passed away peacefully on Wednesday evening 11th July at the age of 97 just two days before his 98th birthday. He was born in Bootie on 14th July 1920 and his family moved to Manchester when he was 16 years old where he attended Eccles Secondary grammar school. After taking the School Certificate in 1937 he started work at the District Bank in Gordon whilst training to be a pilot with the RAF Volunteer Reserve. 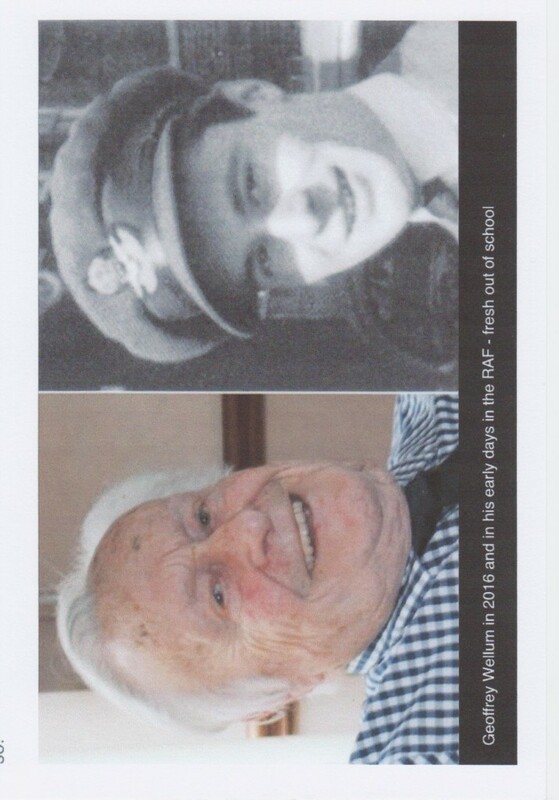 Neil joined the Royal Air Force Volunteer Reserve on 17th October 1938 at the age of 18 and was called up to full-time service at the outbreak of the war. He was posted to No.8 Flying Training School on 1st December 1939 and was commissioned as a pilot officer on completion of the course. He was posted on 15th May 1940 to No.249 Squadron RAF which was an operational figther squadron based at RAF Church Fenton. He flew Hurricanes from RAF North Weald during the Battle of Britain. He flew 141 combat missions during the Battle of Britain but only had one serious mishap on 7th November 1940 when he had a mid-air collision with another Hurricane and lost the rear section of his aircraft but managed to bail out and survived with a minor leg injury. The enemy aircraft he destroyed with the squadron included six Messerschmitt Bf109, two Heinkel HE 111’s, a Messerschmitt Bf110, a Junkers Ju 87, a Junkers Ju 88 and a Dornier Do 17. Neil was awarded the Distinguished Flying Cross on 8th October 1940 and a Bar to his DFC on 28th November 1940. Tom met his wife Eileen after meeting at Biggin Hill where she worked in the underground operations room. They had 3 sons. Sadly his wife Eileen passed away in 2014. 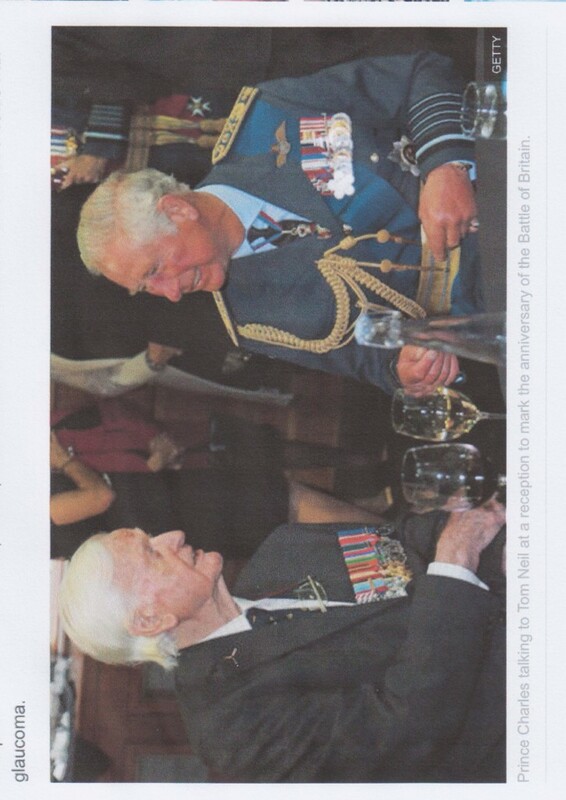 A recent photo of Tom Neil 2) Prince Charles talking to Tom Neil at a recption to mark the anniversary of The Battle of Britain. 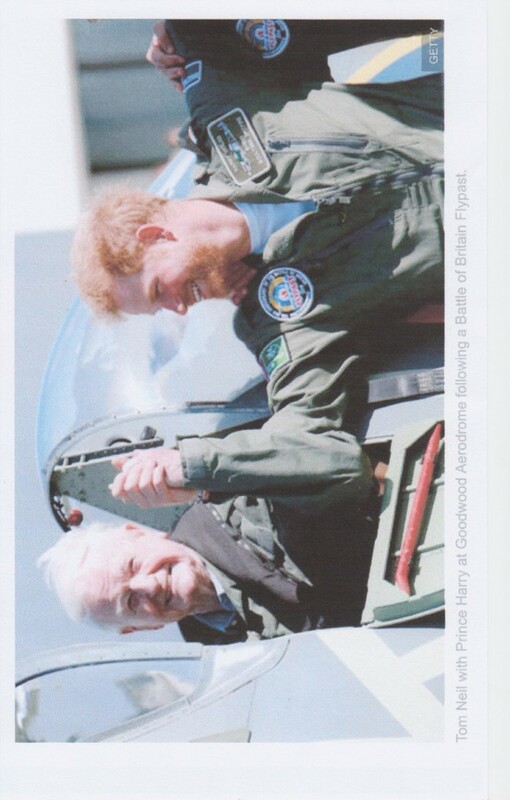 3) Tom Neil with Prince Harry at Goodwood Aerodrome following a Battle of Britain Flypast. Squadron Leader Geoffrey Wellum passed away on 18th July aged 96, was flying a Spitfire in The Battle of Britain before he was 19 years old. Born Geoffrey Harris Augustus Wellum at Waltthamstow on 14th August 1921. Schooled at Forest School, Snaresbrook. As a teenager Geoffrey played cricket where he was the captain but was alwyas interested in flying. ” I just wanted to fly. 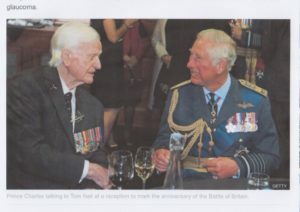 I wrote to the Air Ministry to say so and they let me in ” He was just 18 years old when he joined the Royal Air Force in 1939 and became the youngest Spitfire pilot to fly in The Battle of Britain. After a year of constant combat, including 50 sweeps over France, he was rested and sent to train fighter pilots. He returned to operations in February 1942 as a flight commander with No. 65 Squadron, flying sweeps over France and Belgium. During one fierce combat over Cap Gris Nez, his Spitfire was badly damaged and he suffered from severe headache but was determined to carry on the fight. At the end of July he joined others on the aircraft carrier Furious in the Clyde and sailed for the Mediterranean. During the passage of the vital re-supply convoy to Malta, Operation Pedestal, Geoffrey flew patrols over the convoy and the island and attacked ground targets in Sicily, but his headaches became severe and he was grounded with sinusitis. Doctors recognised that he was exhausted after three years of intense flying. After a rest he was loaned to Gloster Aircraft Company to test-fly the Typhoon fighter, and later in the war he became an air gunnery instructor. 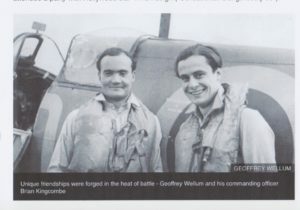 Geoffrey Wellum remained in the RAF after the war and served in a number of appointments in Fighter Command before serving as a weapons specialist in the Second Tactical Air Force in Germany. In 1953 he converted to jet aircraft and six months later joined No. 192 Squadron flying the Canberra on reconniaissance sorties. .From October 1957 he served at RAF Gaydon, the home of a V-Bomber conversion unit, and before retiring from the RAF in June 1961 he served on Thor ballistic missile squadrons in East Anglia. He joined a firm of commodity brokers in The City of London before retiring to live in Cornwall. During the early years of the war he had jotted down some reflections and these formed the basis of his book ” First Light ” The Sunday Telegraph rated it ” one of the best memoirs for years about the experience of flying in war ” The book became a bestseller and was adapted for a 2010 drama-documentary to mark the 70th anniversary of The Battle of Britain. 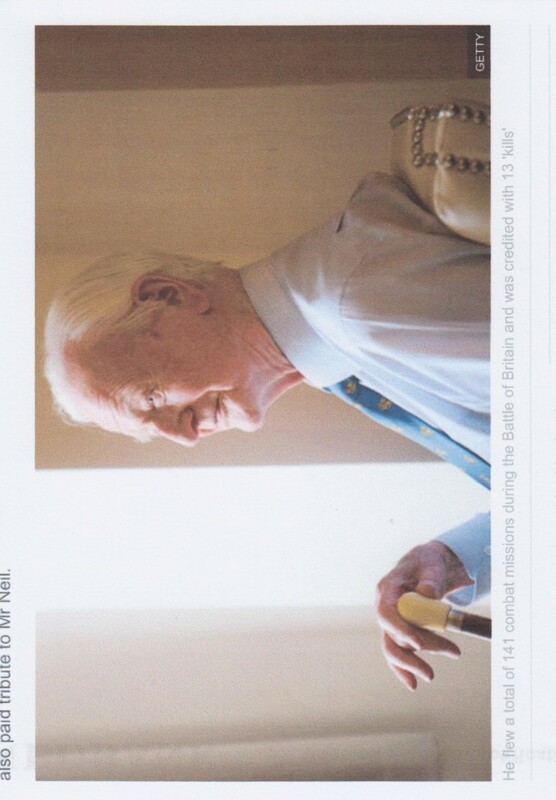 He was a great supporter of the Battle of Britain Memorial Trust. In a documentary to mark the 100th anniversary of the RAF he recalled seeing Spitfires at a fly-past. ” The cockpits were full of ghosts ” he said. Geoffrey Wellum married Grace Christian in September 1943. The marriage was later dissolved. Their son and daughter survive him and a second daughter predeceased him. Geoffrey Wellum, born August 4 1921 died July 18 2018. 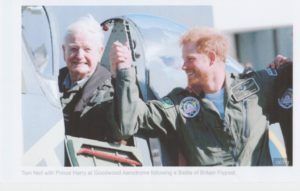 Unique friendship was forged in the Battle of Britain. Geoffrey Wellum ( right ) and his commanding officer Brian Kingcombe. 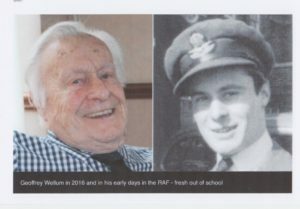 2) Geoffrey Wellum in 2016 and in his early days in the RAF – fresh out of school. 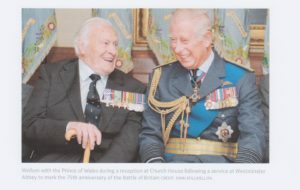 3) Geoffrey Wellum with The Prince of Wales during a recptionat Church House following a service at Westminster Abbey to mark the 75th anniversary of the Battle of Britain. I’m waiting for some information on how many Battle of Britain pilots are still alive. I will post it on the web site when I have the information. There are only a very very few that I think are still alive. Hope you enjoyed this very sad occassion.